It took a long time to construct the tower. 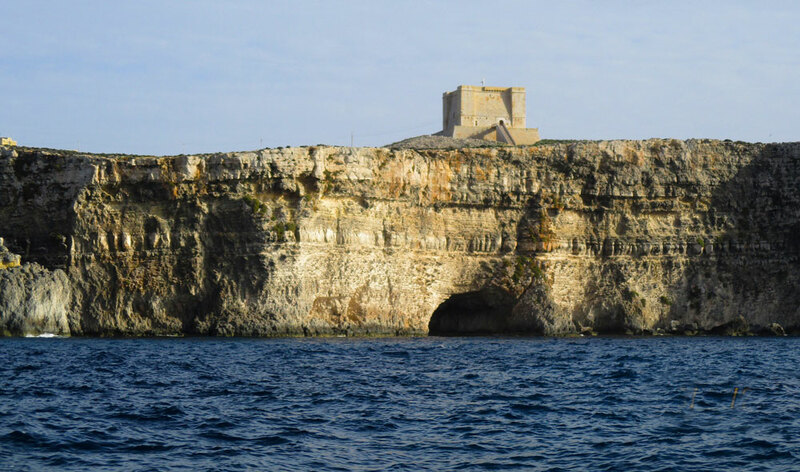 In 1416 the Maltese petitioned the Aragonese King Alphonse V to build a tower on Comino as a deterrent to the corsairs but it was not until 1620 that it was finally completed on the site called Ras l-Irqieqa when 30 soldiers were stationed there. 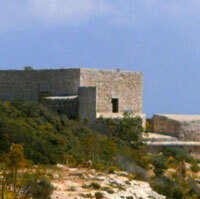 The classical four square fort commands a view of both channels. 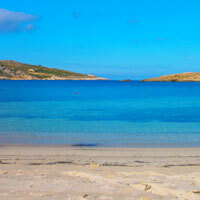 It was built by Grand Master Alof de Wignacourt and dedicated to Santa Marija. 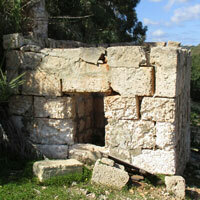 The architect was probably Vittorio Cassar. 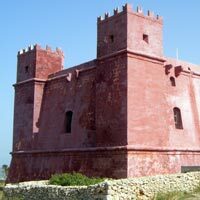 It was the most costly tower built across the islands at 18,628 scudi (equivalent to approximately 2,174 Euros/£1,553 at the time) –approximately 10 scudo to 1 Euro. 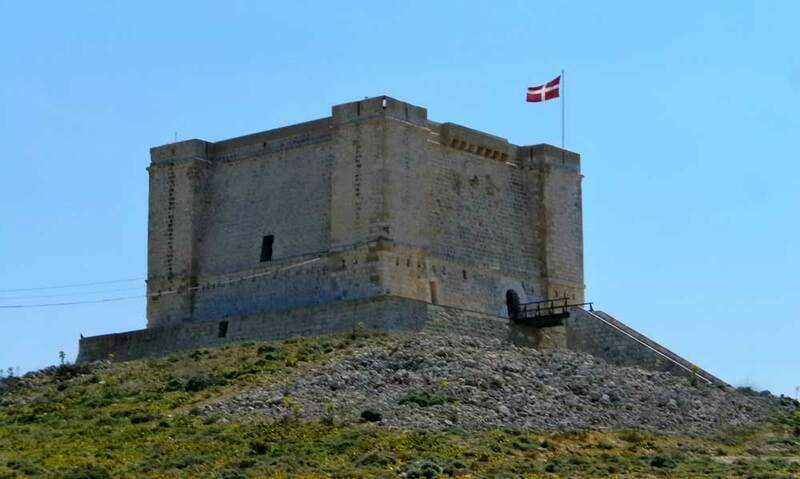 It is the only one with a fausse braye which is an embankment or retaining wall surrounding a tower or fort sometimes referred to as a Rampart or Pre-wall. 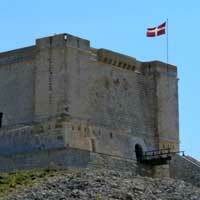 It is located between the ditch and the main rampart of the tower or fort. 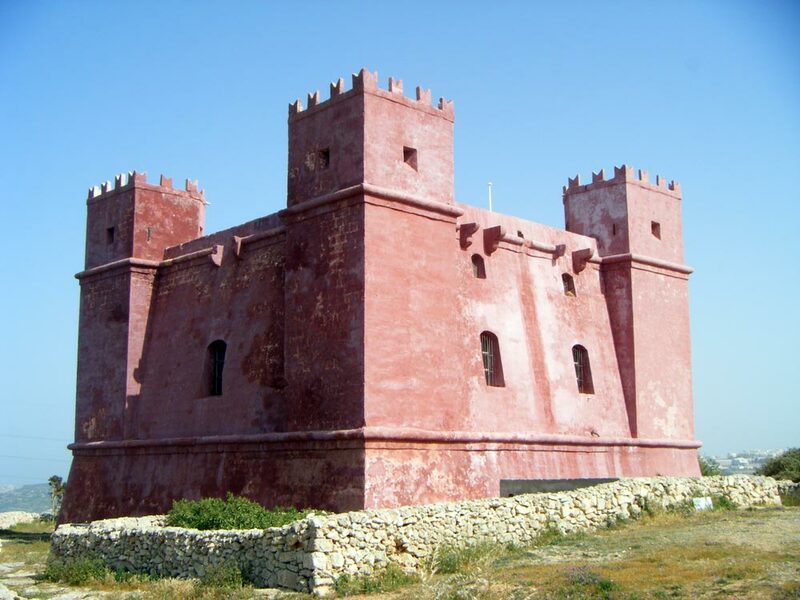 The St Marija Tower aligns with the Red Tower in Mellieha, Malta and the Garzes Tower in Mgarr, Gozo. 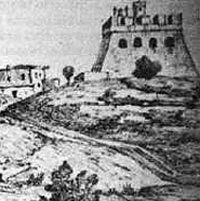 Garzes Tower also known as Torri Garzes/St Martin’s Tower was built in 1605 and demolished in 1848. As mentioned already, St Marija Tower is where offending knights spent their prison sentences in the 16th and 17th centuries. 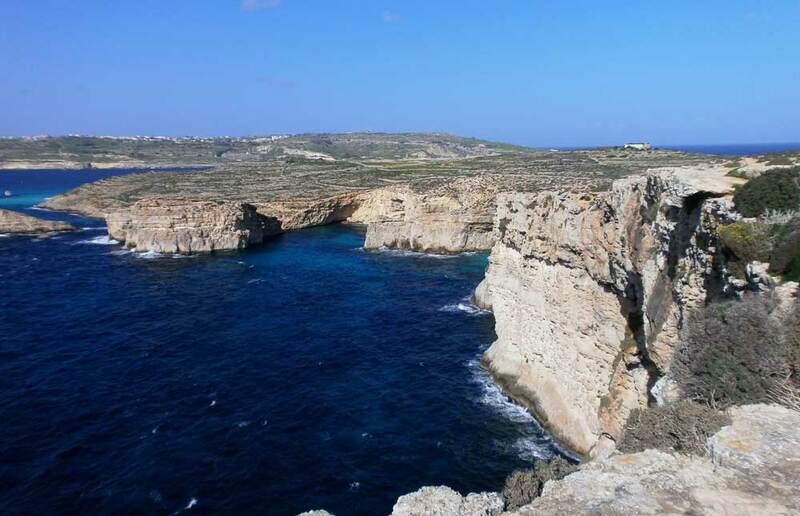 Literally isolated and with the dangerous task of repelling pirates and corsairs they were condemned here for three years. 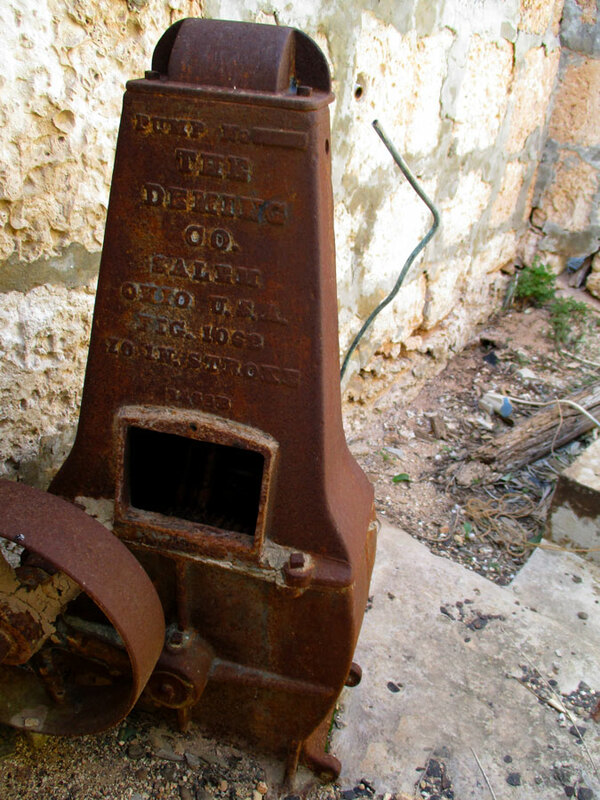 By 1791 the tower’s armament included two 12 pounders, one 10 pounder and one 4 pounder and three 2 pounders. 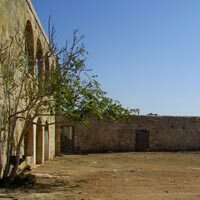 At later times it has been used as an isolation hospital and a winter shelter for farm animals. 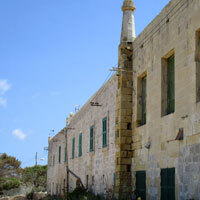 During British rule the tower was used as a prisoner of war camp. 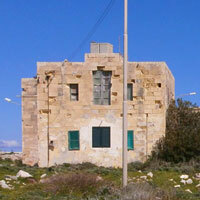 The tower saw service during World War 1 and World War 2 and since 1982 has been the property of the Maltese Armed Forces. 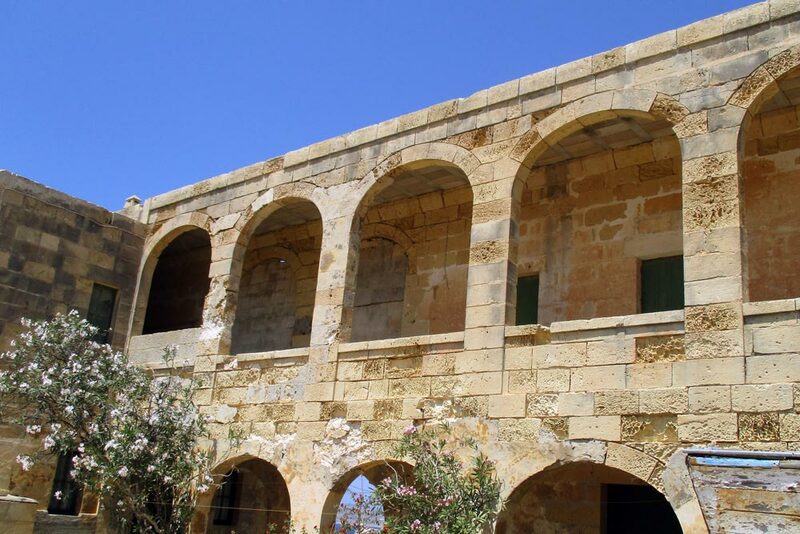 It was extensively restored between 2002 and 2004 and is now open to the public on Wednesdays, Fridays, Saturdays and Sundays from April to the end of October between 10.30 am and 3.00pm – a flag flies when open. 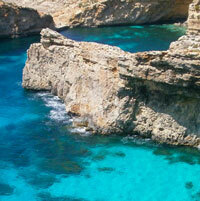 The entrance can be accessed by 35 steps and then a draw bridge 6 metres (20 feet) long. 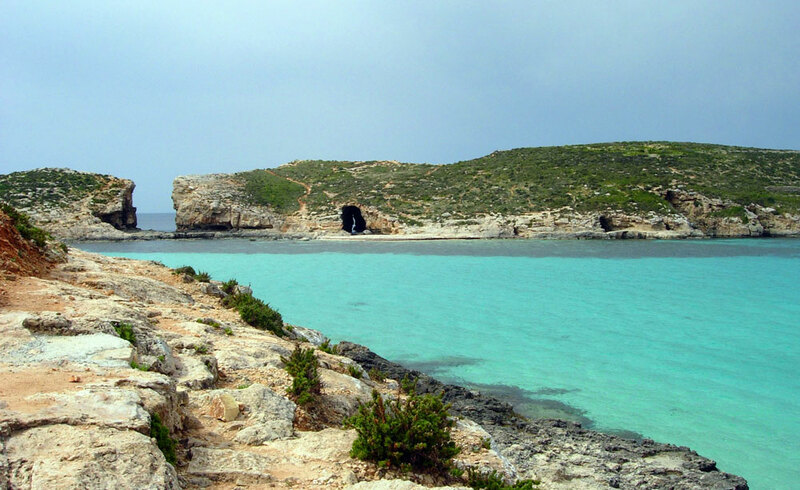 The rightmost image below shows an illustration of Torre Gargzes (top right) from the Vue Prise a I’isle de Gozo. Lithograph by Brocas after a drawing by Ed. 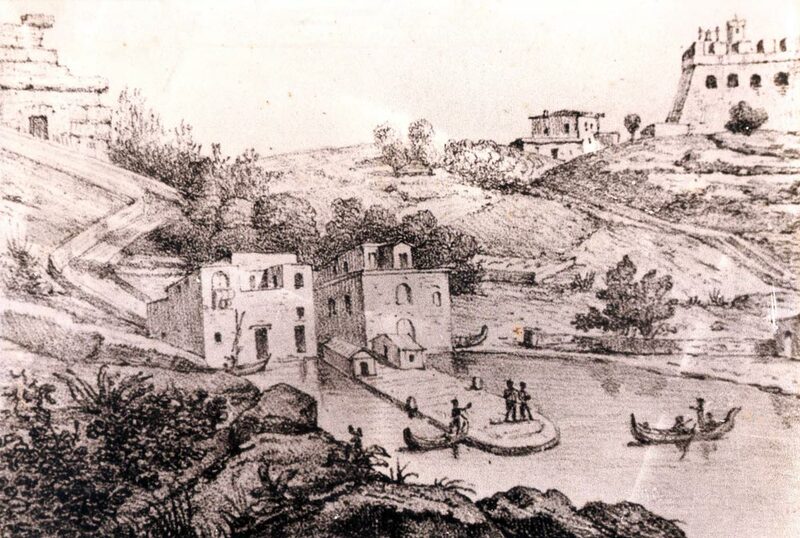 De Montule c 1825. By courtesy of Dr. Albert Granado. 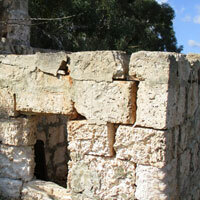 This is a small fortification built in 1715 at a cost of 1,018 scudi (equivalent to approximately 102 Euros at the time). Equipped with two 24 pound and four 6 pound guns. 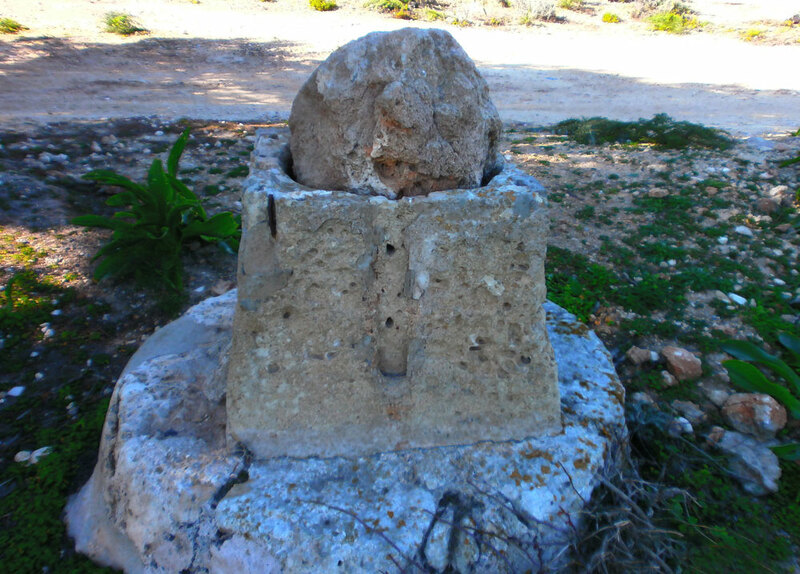 The battery was designed by the military engineer Philippe de Vendosme. 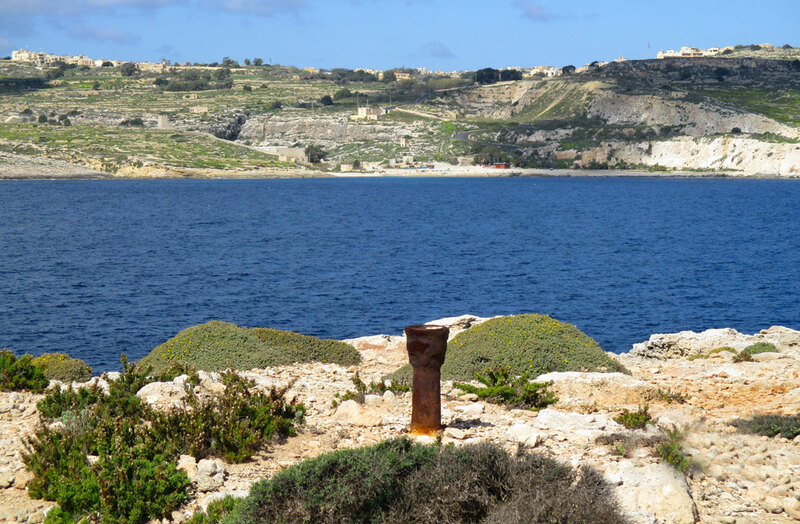 The batteries have a semi-circular gun battery facing the South Comino Channel and the Marfa Ridge on the main island of Malta. 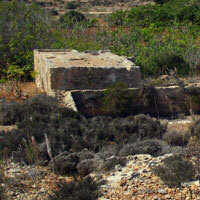 At the rear of the complex is the blockhouse which accommodated the garrison and the stores of ammunition and supplies. 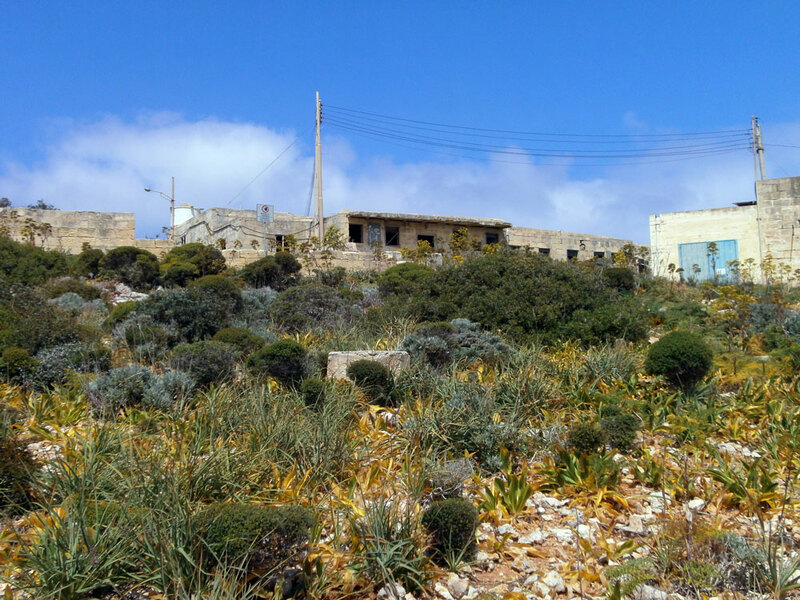 In the 1940/50s a number of families lived in the battery. 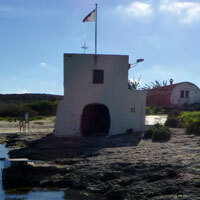 In 1993 the battery was in a state of total disrepair but was partly restored in 1996 with cannons still in place. 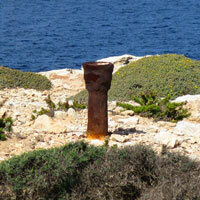 It is one of only three batteries on the Maltese islands. 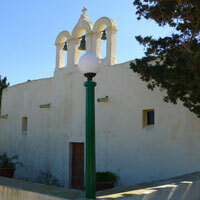 The current chapel was built in 1618. 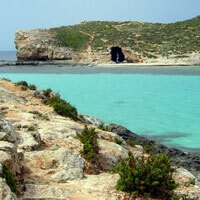 However earlier references to chapels on Comino have been made and cite one in 1296. A record also exists at the National Maritime Museum in Greenwich, London showing a chapel in the 12th century. 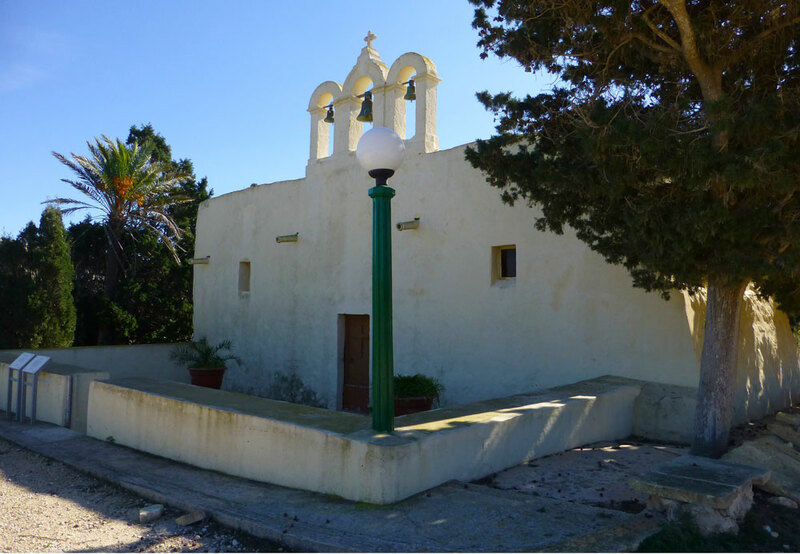 A touch of eccentricity is that some plants inside the chapel are potted in six bofors and four pom pom anti-aircraft shells and are placed on the altar and under the statue of Santa Marija. There are fourteen benches each able to seat three people. 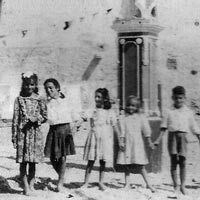 We received confirmation of this from a priest whose mother attended one of these masses and also from Marija and Salvu. 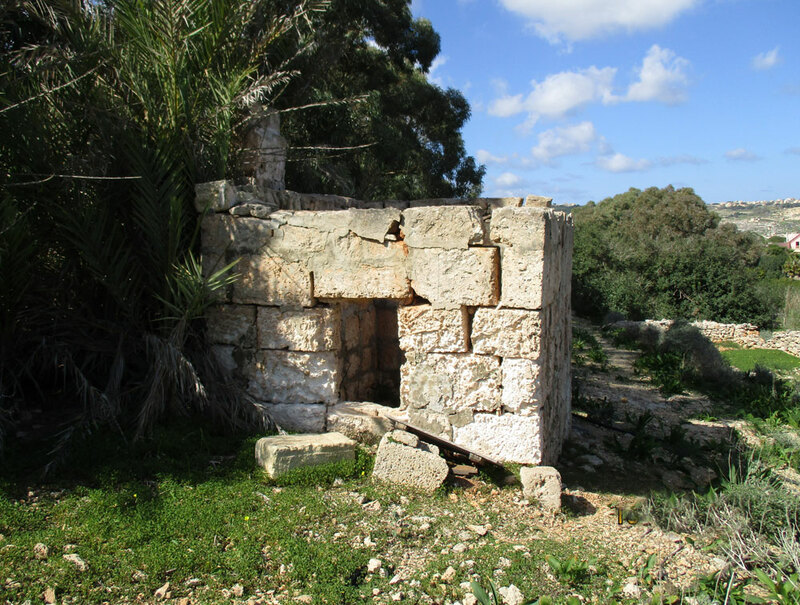 In fact Marija attended one such mass at the age of 15 – 71 years ago. Over the decades a number of priests used to officiate the masses. 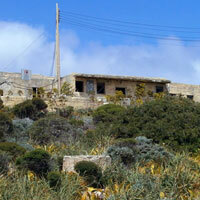 The first two were from Ghajnsielem and the last three from Qala on Gozo. 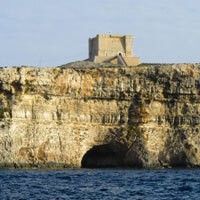 Initially the priests stayed on the island and returned to Gozo every month. 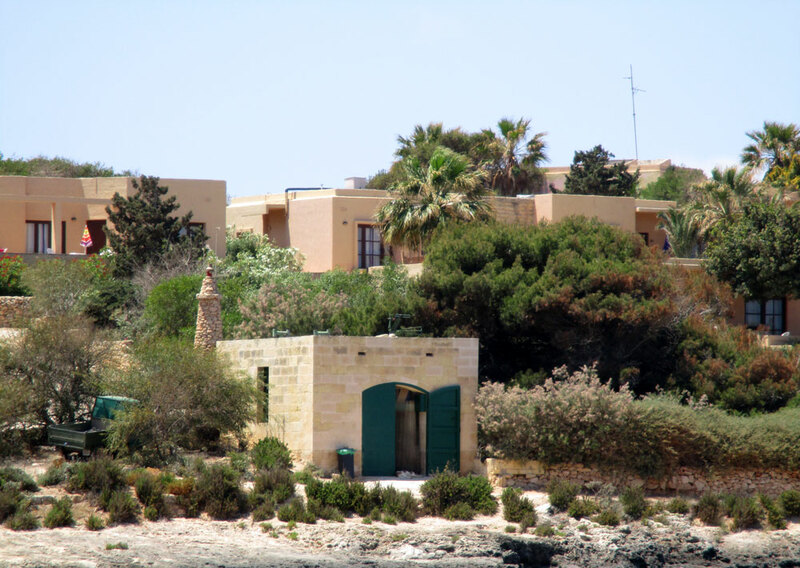 Masses are still held by the priest Father Karm Xerri who commutes to Comino from Qala in Gozo for the island residents, hotel staff and summer visitors. 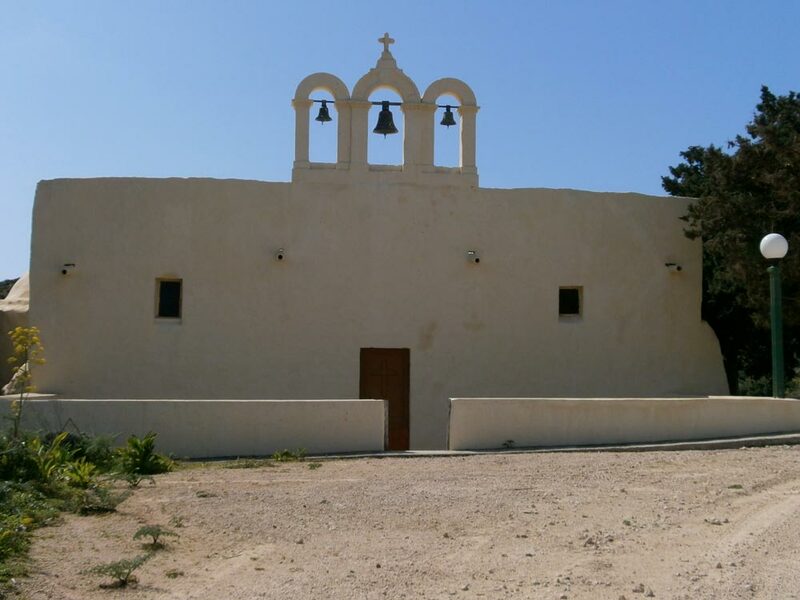 Father Xerri has conducted the Comino masses since 1963. 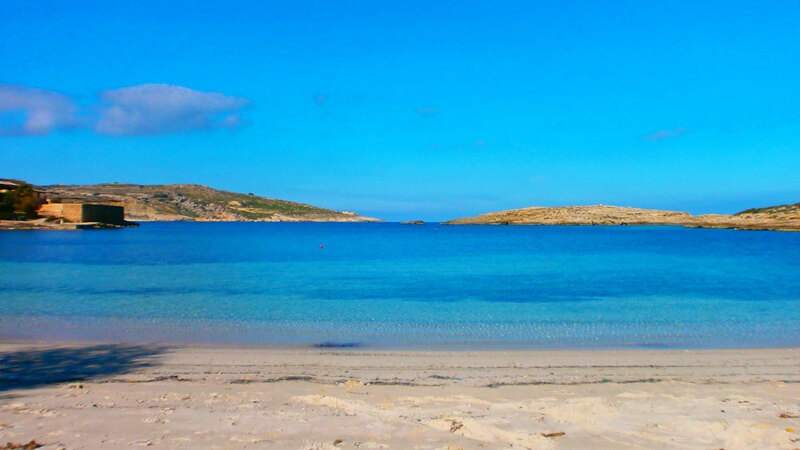 The feast has a long history and was very popular when the island was more populated and then discontinued for over 40 years ago but reintroduced in 2015 and proved an immense success. 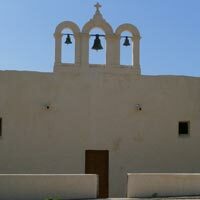 The feast is very closely associated with the history of the Chapel. The 2016 feast held on 19th/20th August was an even greater success and attracted a large number of people. 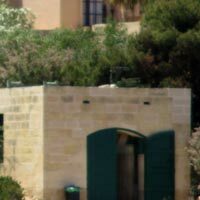 Key figures in its reintroduction were Silvio Buttigieg (relative of Salvu), Franco Ciangura (Mayor of Ghajnsielem), Anton Refalo (The Minister for Gozo) and the five current residents on the island. The feast will now become an annual event. 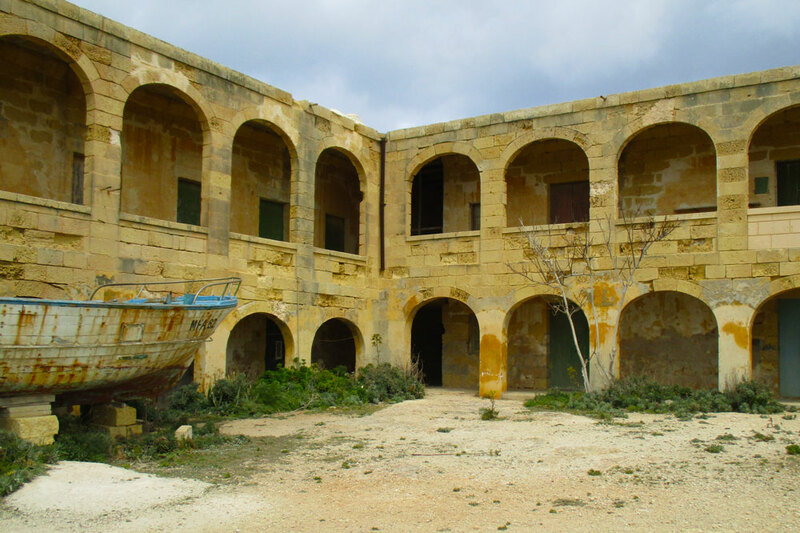 The Festa will be staged each year in the quadrangle near the Isolation Hospital and Palace and this area has been extensively tidied up as a result. 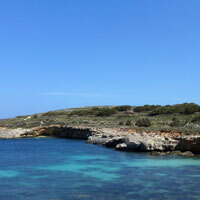 On the way down to Santa Marija Bay from the chapel is a stone structure on the right hand side. 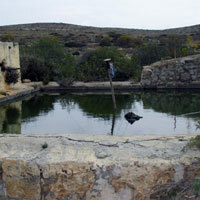 This is a Horza tal Bir (9) which is an example of a well. 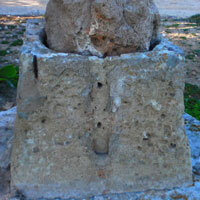 The spherical stone at the top is to stop children falling down into the well. 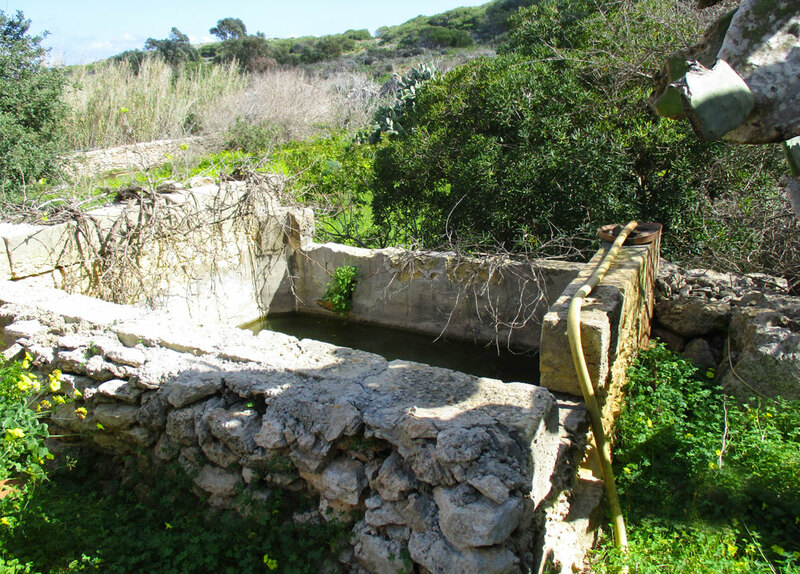 These wells were common across the Maltese islands but are now a rare sight. 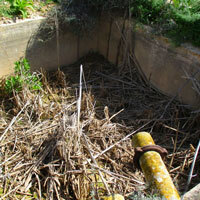 Other examples of wells exist over the island and these are shown below. 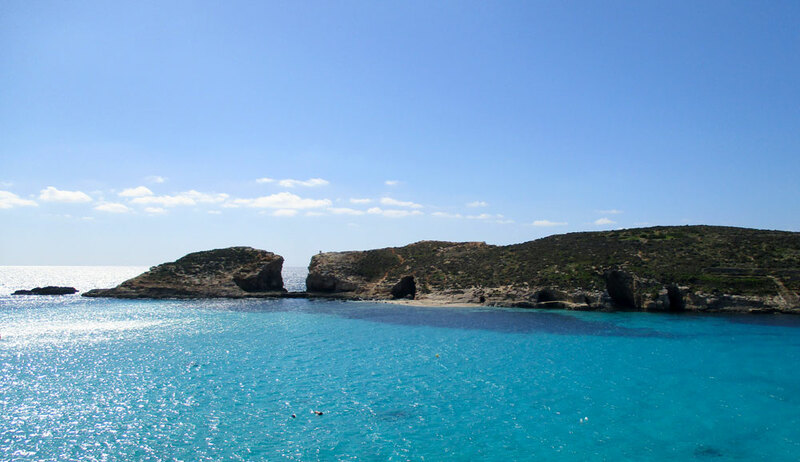 The Blue Lagoon (1) or Bejn il-Kmiemen (literally ‘betwixt the Cominos) has a narrow sandy beach and a beautiful stretch of water between Comino and its sister islet Cominotto (20). 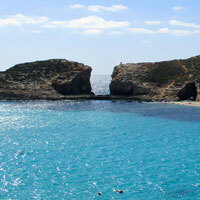 The bay is surrounded by a number of caves and is an ideal place to swim, snorkel or dive. 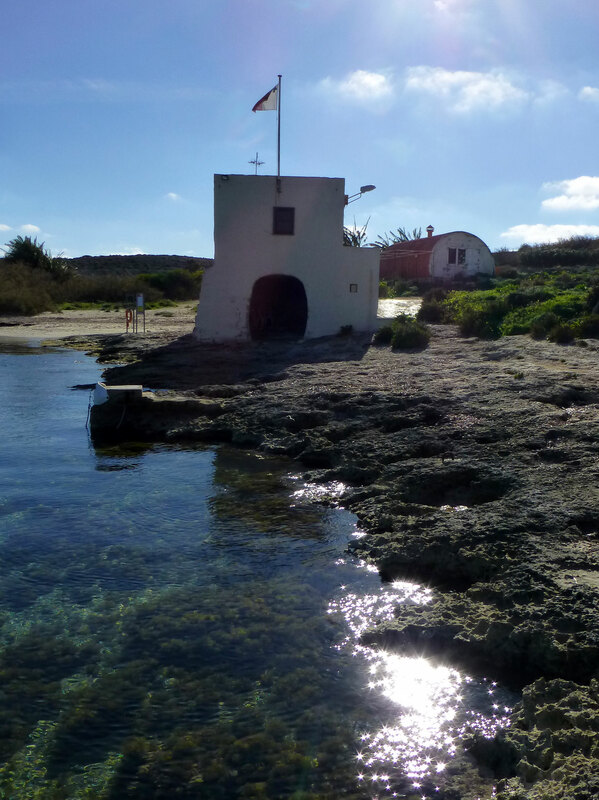 Over the centuries it was frequented by Christian and Muslim pirates who used the lagoon as a base for their marauding exploits in the Mediterranean. 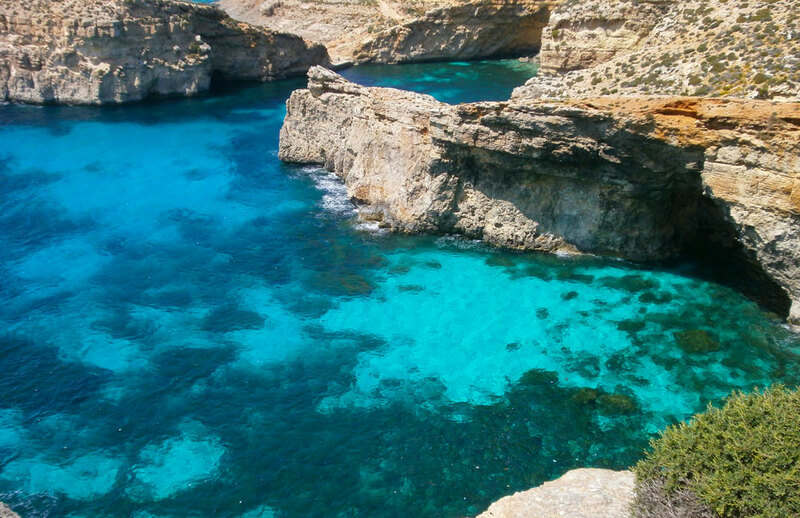 Recent records show that approximately 4,000 people visit the Blue Lagoon in one day at the height of the summer season with all the commensurate consequences! 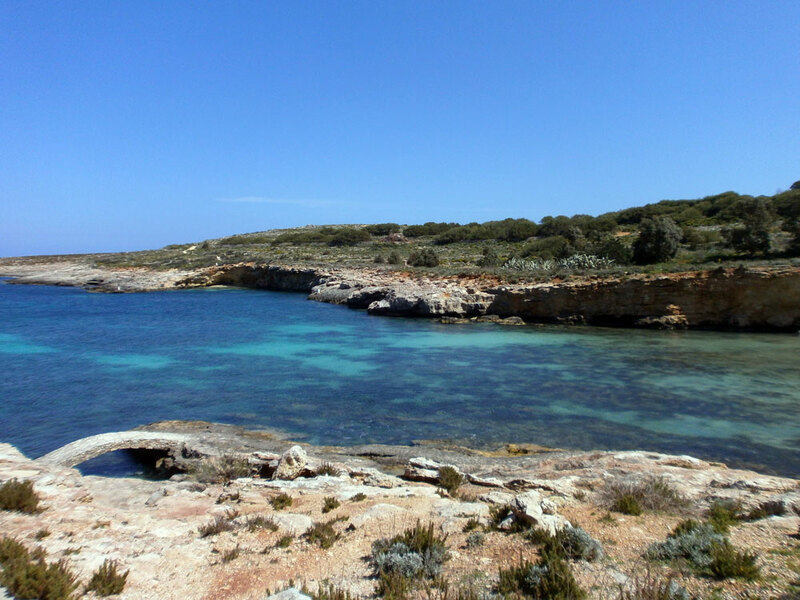 Other small sandy beaches can be found at Santa Marija Bay (13), San Niklaw Bay (4) and the Crystal Lagoon (21) near the Blue Lagoon (1) all offering excellent swimming and diving opportunities. 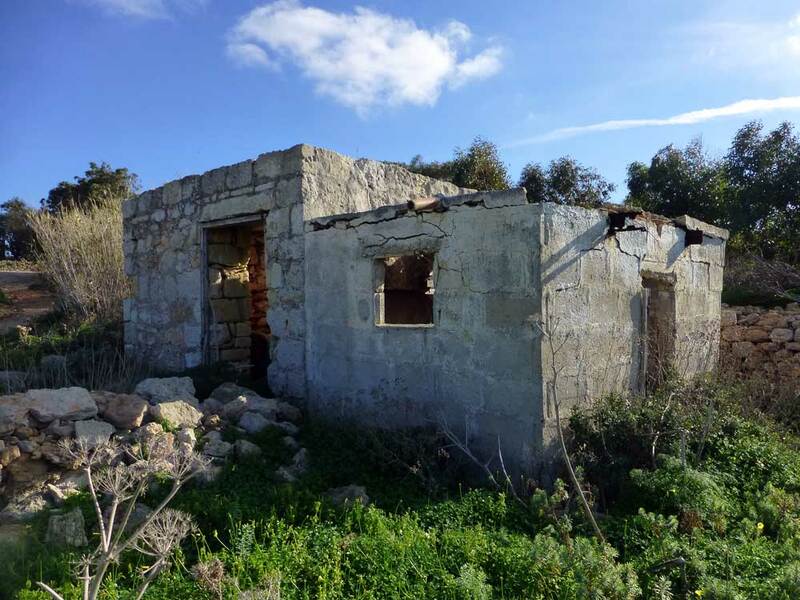 There is an unofficial camp site (10) situated at the back of the beach near Santa Marija Bay which has been slowly developed since the mid-1940s. 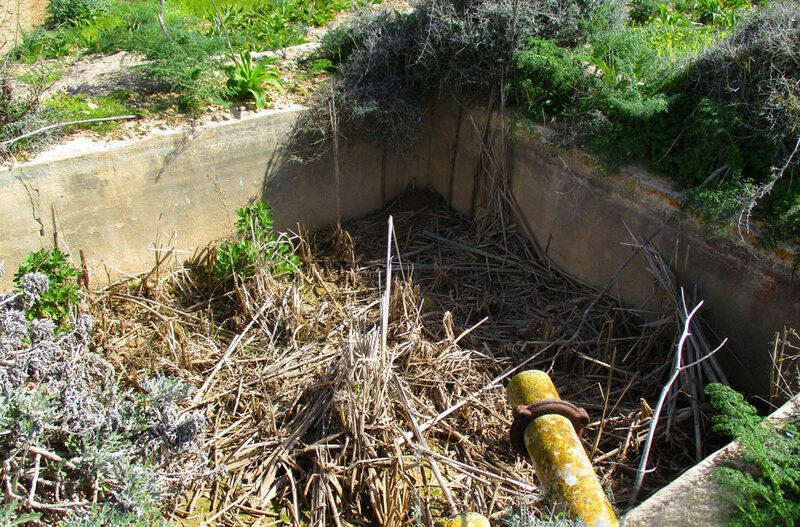 Some forty years ago there were sand dunes where the camp site is now located, but very little evidence of them now exists. 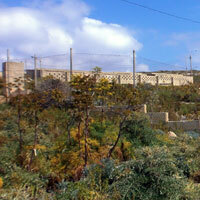 The surviving sand dunes are anchored by a few Tamarisk and Chaste Tree shrubs. 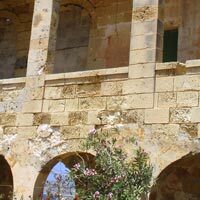 Located close to Santa Marija Tower and built by the Grand Master Alof de Wignacourt is a building known as Il-Palazz (the Palace). 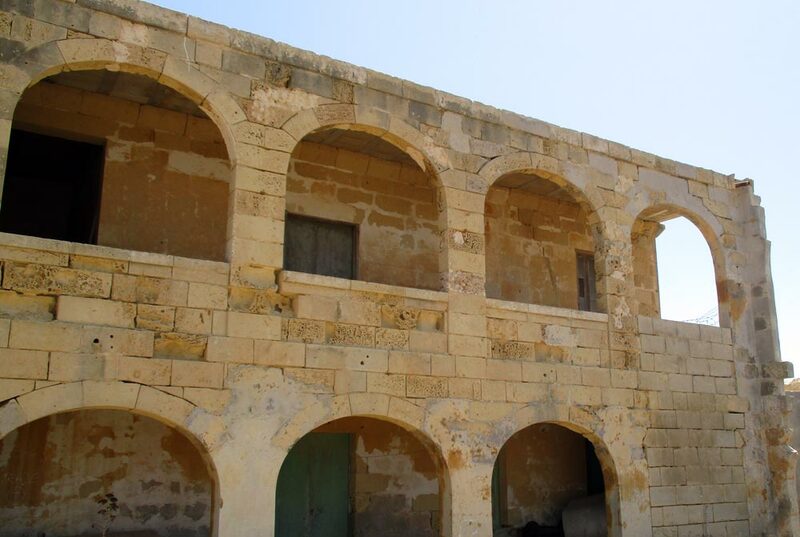 It was extended to serve as an isolation hospital and was used before the early twentieth century to treat patients with cholera and the plague. 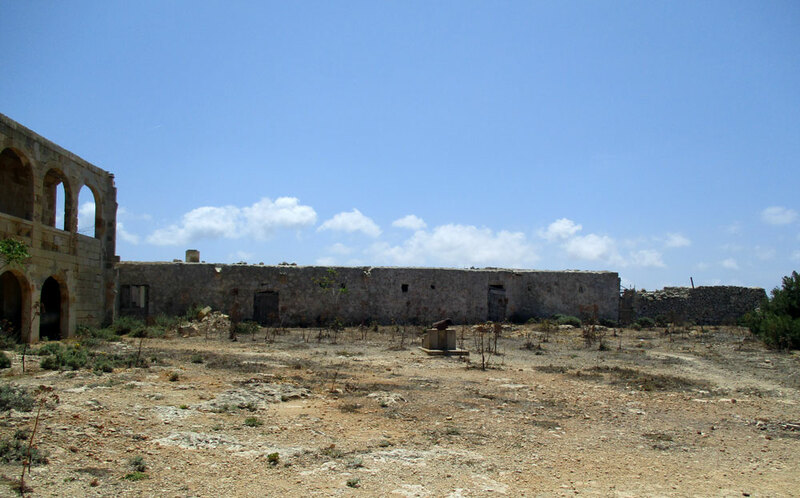 In 1912 the island served as an isolation hospital for cholera sufferers. 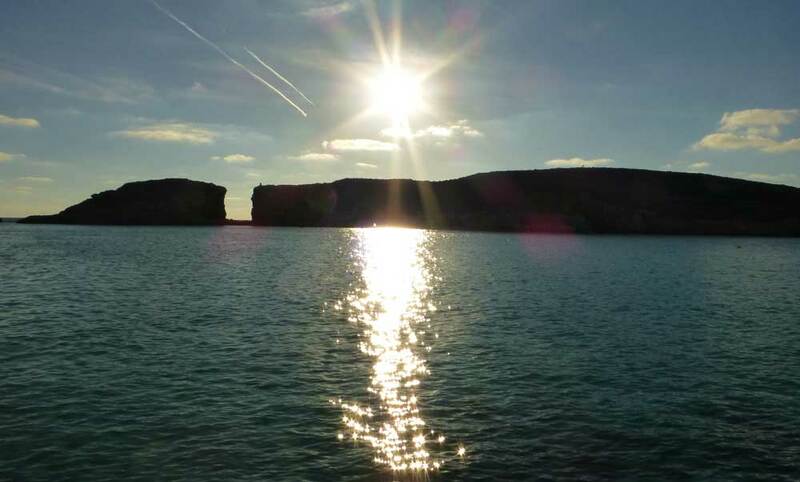 Wounded soldiers from the Dardanelles naval campaign in the First World War were also treated on Comino. 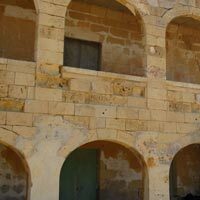 The original buildings and the isolation hospital are showing signs of decay and abandonment even though there is evidence of recent occupancy. The block housed a school for young people up to the age of 16 at one time. 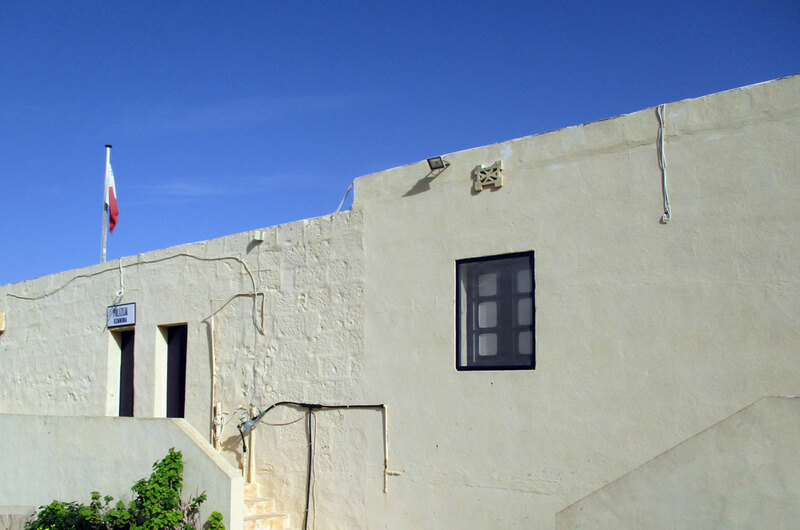 Following a request by Arthur Zammit Cutajar in 1928 for a school to educate the children of the farm workers a school was opened in 1929. The school closed in 1968-9. The rolls varied significantly but in the late 1950s/early 1960s pupils numbered in the twenties. 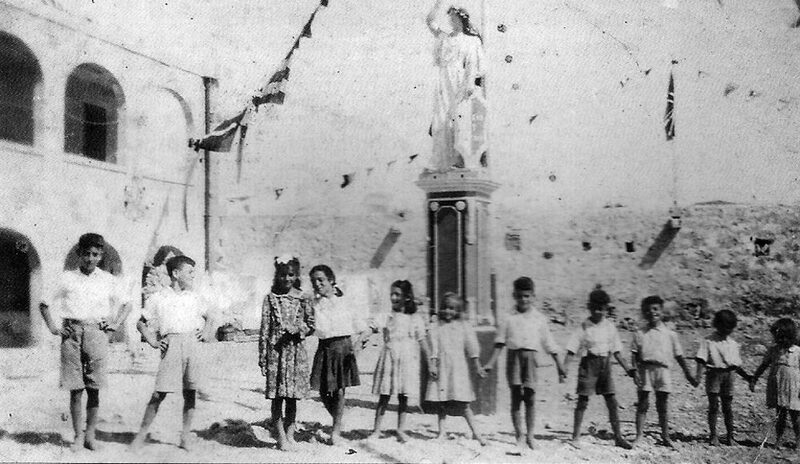 An adult class was staged in 1961. The rolls for the adult night schools were typically around 30. 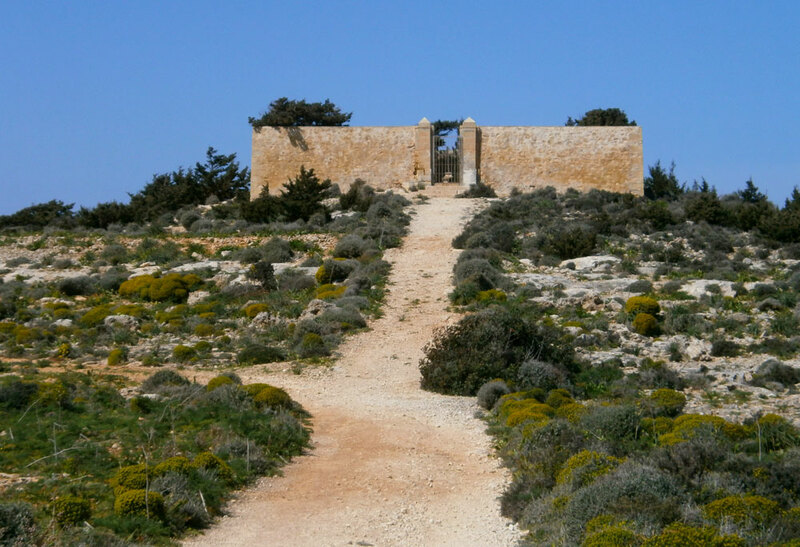 One of the school teachers was the priest from Qala in Gozo who also officiated at the Santa Marija Chapel. 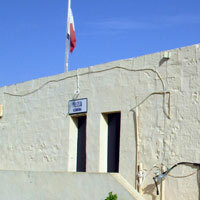 Subjects taught included Maltese, mathematics and religion. 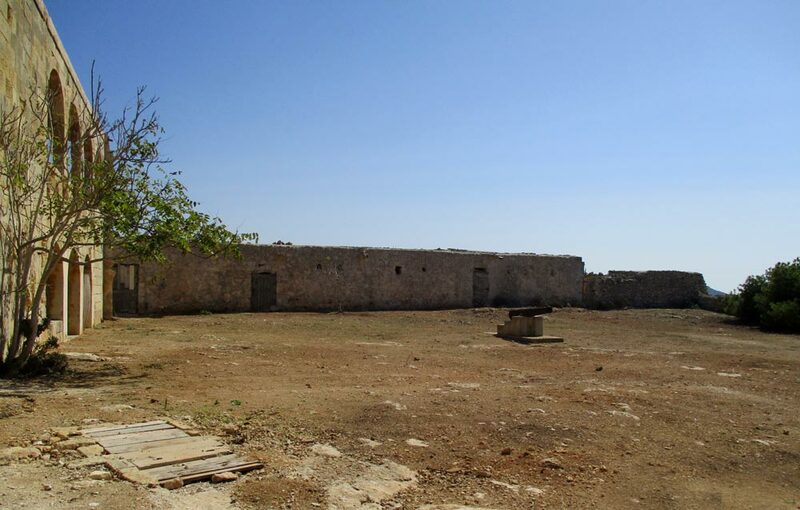 Salvu and Anglu attended the school whilst Marija and Evangelista attended the adult night school and were taught by an English army captain. 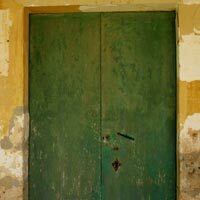 Salvu has the distinction of being the last pupil at the school which closed in 1968-9 when the roll was around 10. 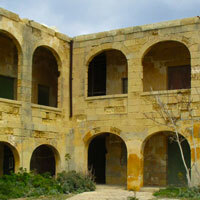 The L-shaped building is the second largest on the island after the hotel complex and comprises two distinct units, the hospital having been built much later and attached to the original building. A much eroded chimney stack delineates the two buildings. 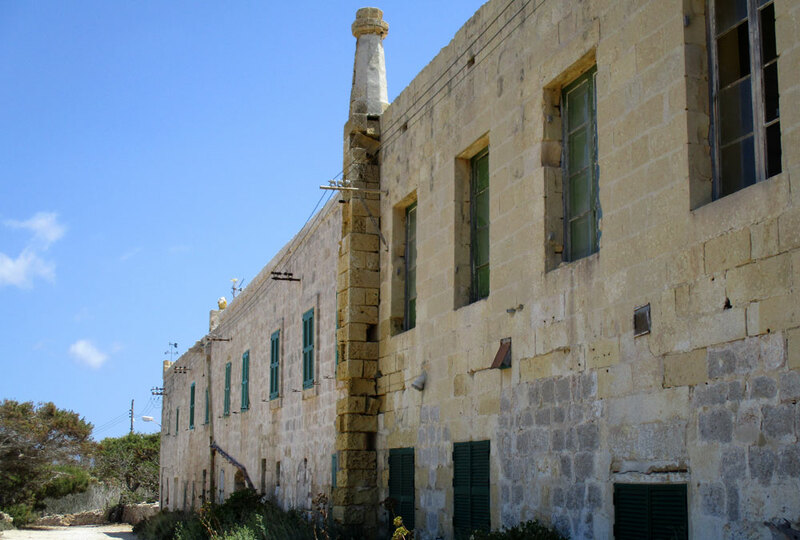 The complex also housed a shop opened in 1927 by Arthur Zammit Cutajar for the workers of his Comino Farming Company it closed when VAT was introduced. 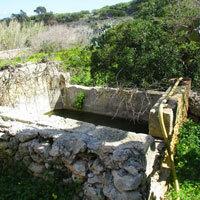 Built in 1852 overlooking the Blue Lagoon at a cost of 456 scudi (equivalent to approximately 46 Euros). 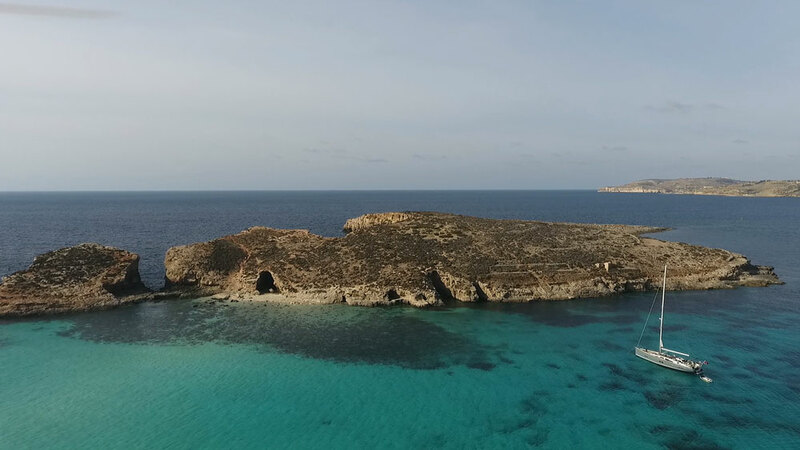 The Comino police service like other stations across the islands was looking for smuggling and contraband activities and other illegal acts such as evasion of quarantine regulations during outbreaks of cholera, plague and typhoid. 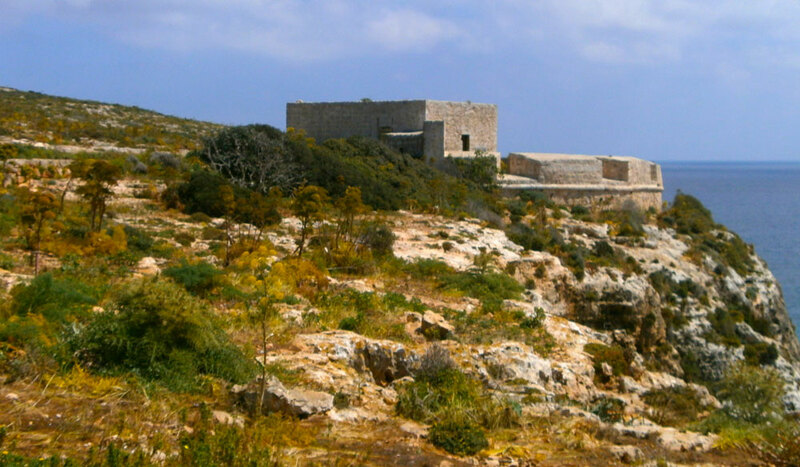 The cost of policing the island in 1897 was 14,447 Euros roughly one third of the total expenditure then made by the Maltese government on security. 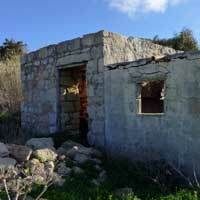 During World War 2 the police station was used as an observation post. 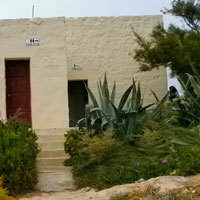 The police station (11) is now located in Santa Marija Bay (13) set above a boathouse at the water’s edge and close to the self-catering holiday bungalows. 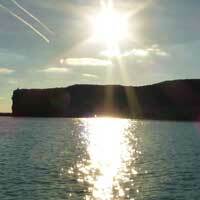 Police officers commute from Gozo to offer a service to the local population and tourists. 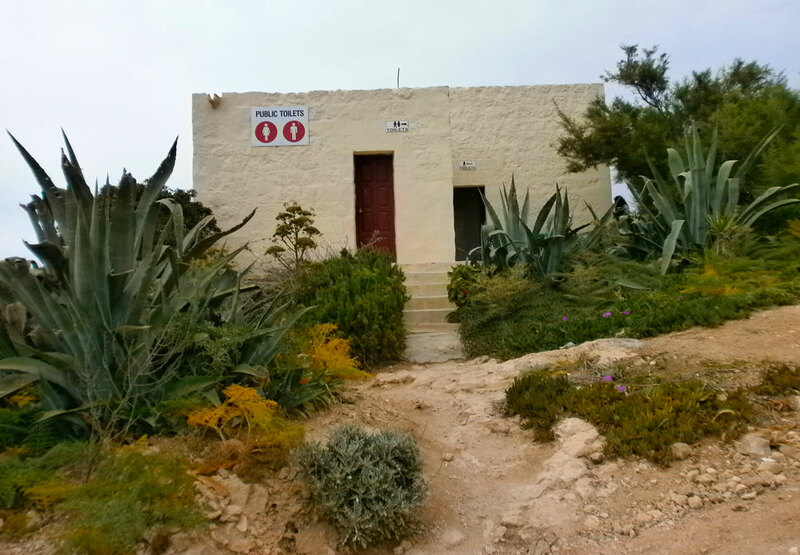 The old police station is now a public convenience and shower facilities located above the Blue Lagoon (2). 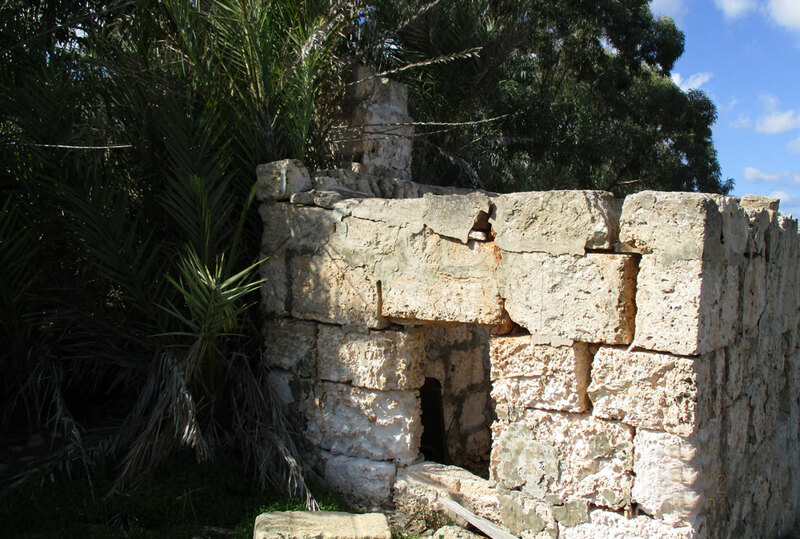 An interesting small building near the Police Station in St Marija Bay was the mortuary and garage for the hearse serving the Isolation Hospital (See photo). 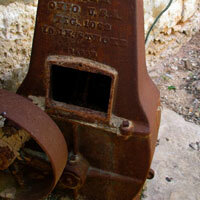 It was seldom used for this purpose. 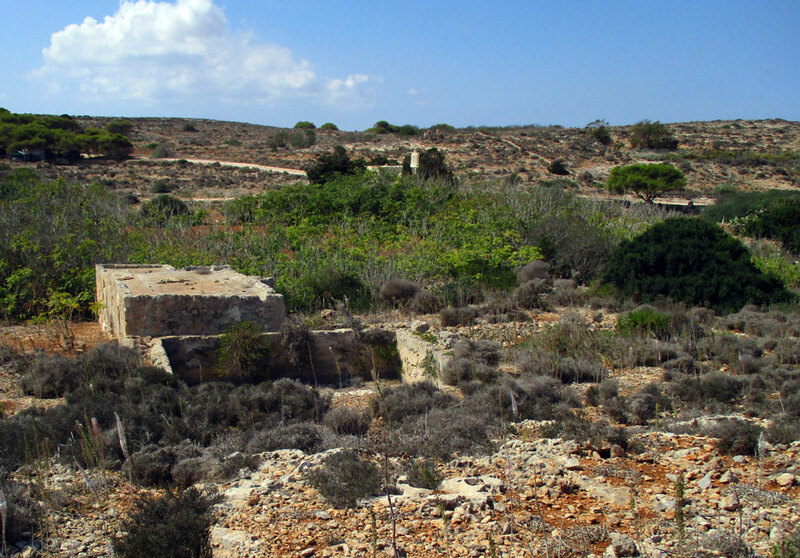 Since 2012 there technically has been a fifth resident living on Comino namely Elvin Cauchi who is employed by the Government to provide maintenance, waste management and planning for the island. 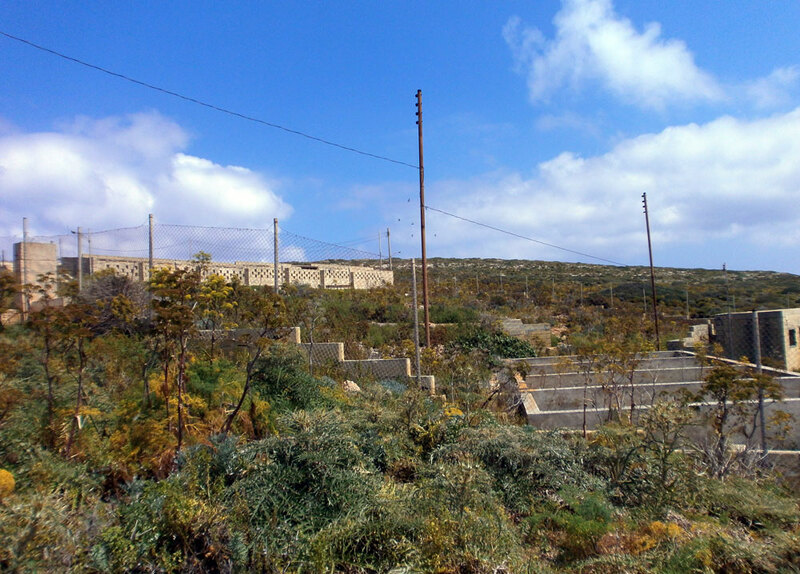 A small cemetery is located towards the centre of the island. 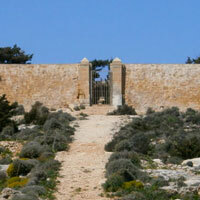 It is a walled enclosure with a small gate secured with a padlock. 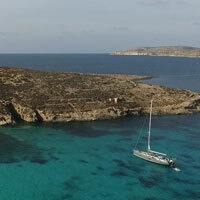 For the past few decades no more burials have been made in Comino. During WW2 bodies of Italian and German service personnel were buried in the cemetery but these have since been repatriated to their home countries. 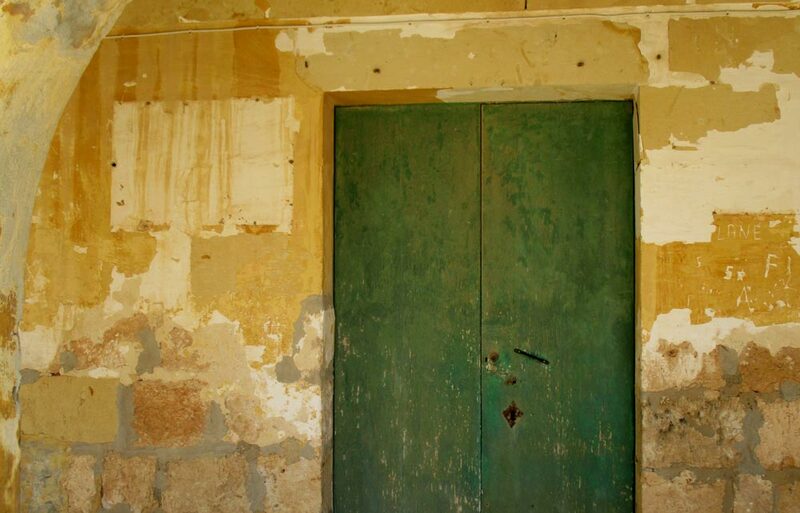 Built in 1979 and returned to the government in 2011 the pig farm used to be a commercial enterprise to research and engage in selective breeding after epidemics of swine fever and foot and mouth disease but it is now closed. 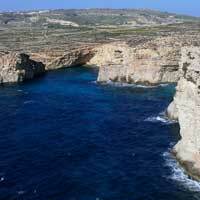 In 1993 for example Comino was used to restock the Maltese and Gozitan pig industry after African swine fever destroyed the existing stock. 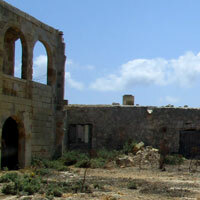 The large and sprawling buildings are now completely derelict and neglected and can be seen at the south-east corner of the island just above the Santa Marija Battery (16). 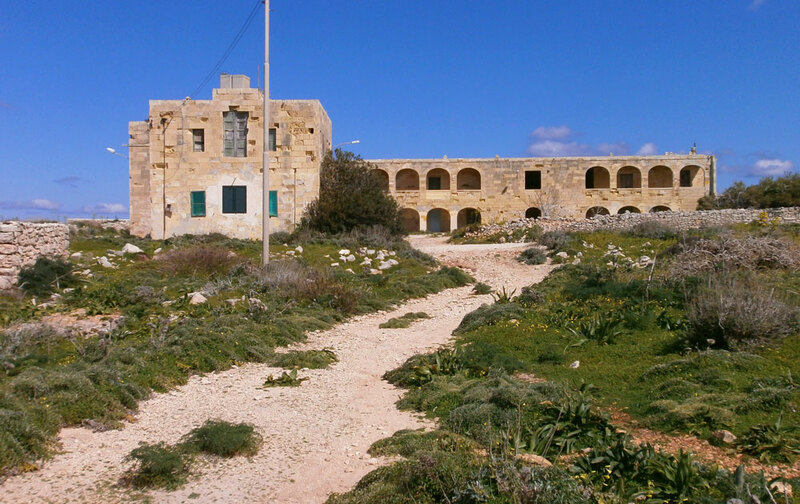 Sadly it is an eyesore occupying as it does a strategic part of the island and if demolished would improve the natural scenery of the island. 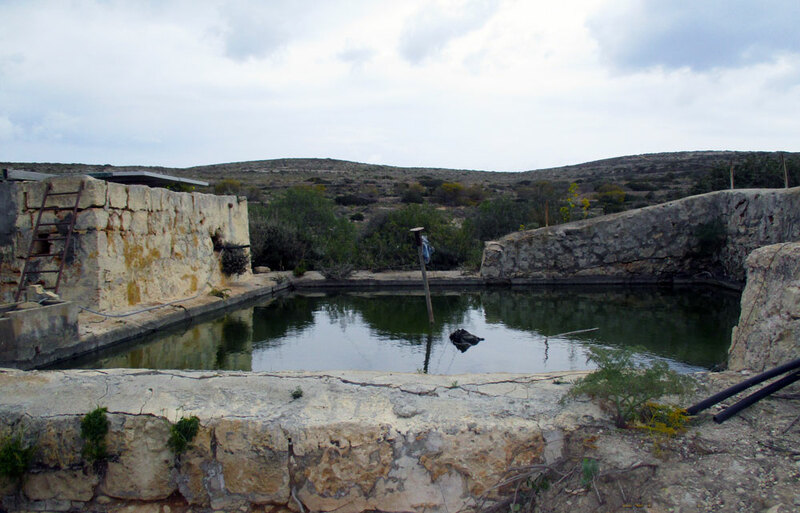 Because of the low light pollution level it would make an ideal astronomical viewing site.